Poll closed Feb 20, 2016 . 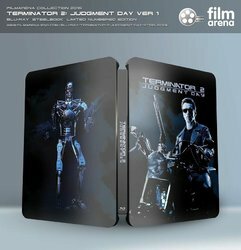 Note: The 4K T2 steelbook will feature embossing on the front and the back. 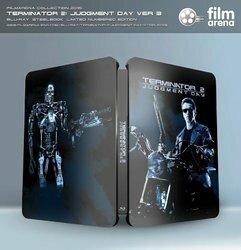 The SteelBook varnish has also been chosen to be matte due to the application of another special layer of GLOW IN THE DARK EFFECT varnish, which is fluorescent lighting in the dark. 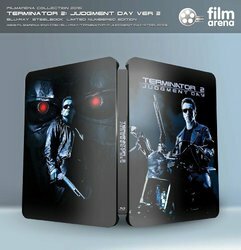 Inside the SteelBook there will be 3 discs - remastered UHD theatrical, 2D remastered theatrical and 2D original ultimate cut. Vote in the poll for your favorite back artwork (click on individual pics for bigger view). Voting is also open at Film Arena's facebook page, link herewith. that's cool ! Exclusive full slip ? Nice this will be perfect to go with my other two. Now just need a gb hehe. Terminator 2 in FA Collection. Oh yeah!!! Hope it gets all three editions of the movie, and polish subs like others two. OP updated with all 4 different versions and added a poll for the community to vote. Have fun. Is that a good idea? Film Arena want people to like the one they want on Facebook, if we have a poll here is it not more likely for people to get confused and not vote where it's actually counted? Maybe they look at this forum for feedback ! @MrBMT Many people don't use facebook and thus are unable to give a "like" on FB for the artwork they prefer. The poll is an opportunity for them to express their opinion. Ah ffs! Seems like not a very bright idea to pass on # 1&3 now!